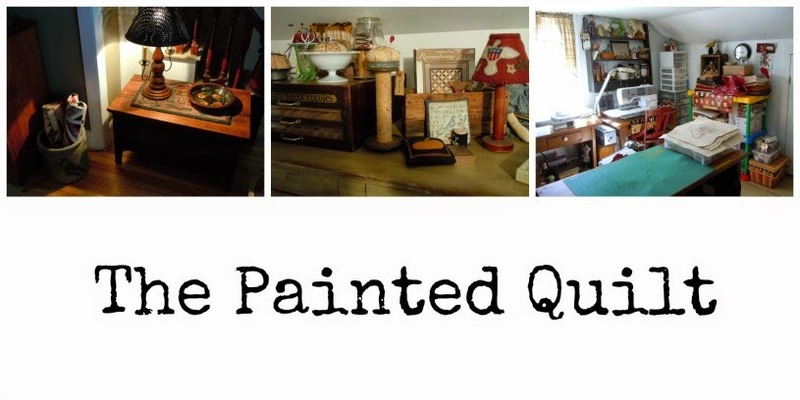 The Painted Quilt: My First Quilt Design…The Reveal! My First Quilt Design…The Reveal! I had been thinking about this design for quite a while but I didn’t even want to attempt to put pencil to paper before all my swaps and Christmas gifts were put to bed. So around the beginning of December, I started the preliminary sketches. I knew I wanted to include both stitching and piecing as part of the overall design, so I did the initial layout on graph paper. It took me a couple of days just to finalize the layout, even before attempting the line drawings for the stitched blocks. I needed to complete the layout first in order to determine the final sizes for the stitcheries. I researched and studied the characters from public domain designs and it took me about a week to complete the stitchery patterns. And so the journey began. I stitched and pieced over the Christmas holidays and gave the flimsy to Nancy…my friend and machine quilter extraordinaire…during the first week of January and gave her ‘carte blanche’ to work her magic on it. Everything that Nancy touches is an original work of art and I left the quilting part in her trusty and capable hands. We met this past Friday and if I didn’t know better, I would have believed it if someone had told me that the longarm quilting fairy resides at Nancy’s house. What an incredible job she did! Every square inch is custom done. The quilt is called “ Raggedy and Friends”. It is made up of 12 blocks and is done in my favorite scrappy style. I spent the better part of the weekend affixing the binding and adding the decorative vintage buttons and glass beads. I apologize for the blurry photos but I think you can make out the stitcheries and the amazing quilting. It had crossed my mind to offer it as a free Block of the Month but then had second thoughts since there are so many beautiful BOM’s out there already from which to choose. What do you think? Thanks for allowing me to share my first full size quilt design. After designing in the decorative painting industry for almost 25 years, I have found it very difficult to shut down that part of my brain. I guess I’m happiest when I’m designing and really all that has changed is the medium…fabric in lieu of paint. I even find that I’m using a very similar color palette to what I use when I paint. And now it’s back to the drawing board. I have so many other ideas floating around in my head I just wish that there were more hours in a day. Having said that, remember that this Friday, the 5th of February, is the First Friday of the month, which means that it’ll be time for the next FFF (First Friday Freebie). Think ♥’s! Charming. Warm. Cozy. Sweet. Love how your painting talents translate to quilting and other crafty works. Great creative mind. I think you'd have a following for sure as a BOM. I spied a sheep...of course. And the quilting...yes you have a quilting fairy. GORGEOUS! you already know my thoughts, but i'll tell you again............. stunning! a true work of art. not surprising though. I really like this quilt! One of my earliest memories is of dressing as Raggedy Ann for Halloween. I'm 40+ years old and I still have my Annie...she's a treasure and I"d love to make a quit for her! Wow, I love it, it is really amazing and yes, I would definately take it on as a BOM-are you selling it as a pattern? Oh! What a lovely quilt! I think it would be great to make it as a BOM. If not for free, you can buy it. I know I'd make it if I get the opportunity. Another wonderful creation from you! I am always amazed at how creative you are. Beautiful quilt and I think it would be great as a BOM. I am so glad that you are still creating in the form of sewing ...instead of a paintbrush you now hold fabric in your talented hands. Kaaren, What a lovely balance of color and texture - your quilt is a treasure. It would be most generous of you to share it as a BOM. I love the colours of your quilt and the quilting is amazing. Great job! Your first? Kaaren, you have an amazing quilt - best wishes for where it will take you! OH MY! Such a beautiful quilt, it would be great for a BOM quilt. The quilting is just perfect, this is all i can say. WONDERFUL! have a great week. HAPPY SEWING! I would love to make your special quilt! Could you offer it as a free BOM on your site? Many years ago, I made Rggedy Anns and Andys to help pay some of my college expenses. Very special and your design is wonderful! The quilt is wonderful. I do hope you will change your mind about the BOM or in the future you will post where we can purchase the pattern. I happy for you that you've found a new outlet for your creativity. What an amazing job all the way around! Keep it up. Absolutely stunning, Kaaren! Thank you for giving us a look at it! You are indeed truly gifted. Have a great day! Karen, Such talent! I think you should not try to shut down that creativity but let it naturally flow. It's obviously what you were born to do! Stitch on! Press on and keep the creative juices flowing because girl, you've got some talent! Your quilt design is beautiful! I think it would make a fabulous BOM! I know I'd love to make one! :0) Thanks for sharing your talents with us! Incredible, wow! It really is a work of art. That design is so unique and charming, I think it would do really well as a BOM. Just outstanding ... I could look at that all day! The quilt is stupendous! You put a lot of work into it and it shows. The quilting is amazing too. There's always room for another BOM...especially your's! It's very unique and different. What a beautiful quilt, your talent truly shines thru~!!! I love the Raggedy theme, what great memories~!!! There are a lot BOM but all with a different aura,so will be nice if you decide to do it as a BOM,your quilt is GORGEOUS!! I think that your quilt is fantastic. A little bit of everything incorporated into a wonderful quilt! Congratulations on such a great first attempt. I think that it would make a great BOM. Congrats, Kaaren. Wonderful pattern...cozy, warm, inviting. It would be a fun bom. I really enjoy all of your designs. Kaaren, it is positively wonderful! I am such a Raggedy Ann & Andy fan...I can't begin to tell you. If I could stitch I'd be on it like Bees on Honey! It's just beautiful! Wonderful quilt, Kaaren! I like how the black sashing ties everything together. Fantastic! Yes, I think you would definitely have a BOM following. :-) I love the quilting too. I love the quilt! I would def pay to have the pattern! I cant believe that's your first quilt design! I love the colors and the quilting is beautiful too! Hooray for you!!! Kaaren...are you sure you do not have a few little quilt fairies running around your house? You are an excellent designer. And you are lucky to have your quilter expert near you. It is a marvelous quilt. You must be so very proud of all you do. Love it! You definitely have an eye for design. And your quilter...wonderful! I think it would be a great success as a block of the month...looks like a great stash quilt too! A wonderful design! Your talent just keeps flowing. I would love it as a BOM! My style of quilt. 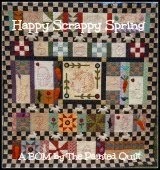 Well done Kaaren, such a cozy quilt that includes two of my favourites, stitchery and scrap quilts. A wonderful branch added to your artistic tree, congratulations. Cozy! Love the arrangement and colors! It's a fabulous design!! I think you'd have quite a following for this as a BOM - Raggedy Ann is such a favourite of so many different people. You did a beautiful job, the quilt is gorgeous and love all the different mediums used in it. Kaaren it is so amazing!! I love the colors, the stitcheries, the design...everything. It would make an awesome and popular BOM for sure! That is one beautiful quilt to be treasured and I did notice a little sheepy in there too.....LOL. Ditto to all the lovely comments Kaaren.. It's beautiful!! But then it's you and you're gorgeous and make gorgeous 'stuff'!! congratulations on your achievement! Love the quilt. I'm sure you would be overwhelmed with followers if the BOM was up for offer. Kaaren, that quilt is truly amazing. You are such a talented woman and I can your slip into quilt design being a lovely transition for you. Anyway you present the quilt pattern would be amazing, BOM or full pattern. People would definitely be keen. Oh! What a lovely quilt..Another wonderful creation from you! Looks like A BOM would be popular..
Wow! This is a stunning piece of art and yes please share as a block of the month. It is beautiful! Love the colors and block designs. Just stunning!! The colors, the pattern and the quilting. BOM or sell the pattern, whatever makes you happy will make us happy! Absolutely gorgeous!! Love it!! A true work of art!! Take care! I love the quilt, wish I still had my Raggedy. The quilting is perfect for it as well, you are very talented. I must tell you I love your header picture, I love the crock lamp. I searched for 3 years for the just right lamps for my living room, and this lamp would have been a contender. Beautiful,a wonderful quilt it would be a very nice BOM. Raggedy Ann was always one of my favorites. Oh Kaaren, I'm SO glad you switched to textiles, lol!!!! That is a fabulous quilt - you could offer it as a BOM from quilt shops, market the pattern, so many things! You are SO talented, girl! The quilt is just gorgeous! I love the combination of embroidery and piecing. I think it's wonderful Kaaren and you are right, the quilting has made it very special. I love the stitchery designs. If you would be willing to share them I would love to give stitching these cute little people a go! Kaaren, your design is wonderful, and Nancy did a fantastic job with the quilting. WOW!!! Kaaren, you just amaze me. The quilt is fantastic! I love Raggedy Ann. I'd make this in a minute. The quilting is beautiful and the way you've put the top together is so wonderful. It is just adorable Kaaren - a true work of art! I'm amazed at how quickly it went from a dream to reality! Wonderful. I was so excited to see this on your blog this morning and kept reading hoping the pattern was going to be a free BOM. 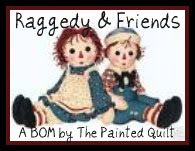 You see, I just finished making a Raggedy Ann doll last evening for a Christmas present for our DGGD this coming year, and that quilt would go perfect with the doll. Hope you don't mind but I posted your blog address on my blog so the family and friends that go there can go see what I saw!! Please let me know if you don't want it there. Love the quilt and the colors. Looks great on your table. Ohhh Kaaren, it is so lovely. So creative. Isn't it really fun to create something from start to finish. You know all about that but I know. But it is so wonderful. Kaaren, that is a most stunning quilt, well done!! I think many would love to snuggle up under that quilt (tho' maybe not altogether). I think it would be just great as a BOM, I mean just look at all these comments will you!! Congratulations! Kaaren, you are so creative. You did a fabulous job and you should enter it in your fair this year. Your machine quilter did a fabulous job too. Kaaren, you have really wowd us this time..It is so sweet and the colors are spectacular.. Whatever you offer it will be great.. 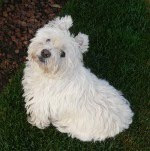 I love the Raggedy's , really cute.. Your design is gorgeous! I love the fabrics you chose, the pinwheels scattered throughout, the embroidery... what is not love?? Congrats and why wouldn't you SELL it? It's beautiful! Warm cozy colours, lovely stitcheries, and I'm wishing those quilting faeries would come by my house somethime! Love the quilt and the name. I love Raggedy Ann and Andy dolls. I have one my mother made and others. I would love a BOM, but enjoyed seeing your quilt. You are so talented. I'm sure you miss the design part and we are so lucky to have you share your freebies design each month with us already. together to make it come to life in such a gorgeous way! Such a sweet quilt ~ the colors are wonderful and the Raggedy's are great ~ love them in any size,shape or form. A BOM would be great! Thanks so much for the free items. YOU HAVE SOME GREAT STUFF!!!! will have to come back here often to see what you are up to. Keep on drawing and stitching. Love the redwork and bluework, isn't it sooo relaxing to do!!! love your work, found this blog through a friend's link. you have GREAT stuff. will be popping in now and then to see what you are up to! This is absolutely wonderful. And the quilting is spectacular! Kaaren, It's beautiful. I love it. Your quilt is soooooooooooooooooooooo wonderful!!! Beautiful quilt and I do love the quilting on it! Now, did I meet your friend? Hum... I recall someone coming to the shoppe who was a machine quilter! Gorgeous quilt! Thanks for sharing! Cheers! It is absolutely lovely. Really beautiful.